With its spotless, mega-sized department stores, sprawling clothes markets, and back streets choc-a-block with little independent shops, Seoul is up there with the best in terms of being a go-to destination for a major shopping spree. 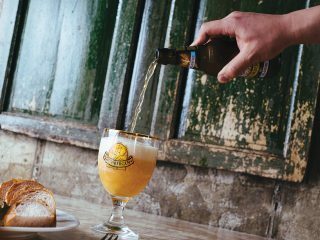 Myeong-dong, Dongdaemun, Apgujeong, Ewha and Hongdae – as well as countless smaller neighborhoods – offer a seemingly limitless choice for anyone wanting to drop some serious cash. But what about the options available for those of us looking for a more sustainable – and affordable – purchase? There was a time when second-hand stores in Korea were a relatively rare sight, and once-weekly flea markets promised little more than piles of incomplete jigsaw puzzles and dented shoes. Times are changing, however, and the city is now home to a selection of fantastic options for places to scout out cheaper and eco-friendlier finds. We’ve rounded a selection of the best second-hand stores and flea markets in the city, so you may need never again buy new. 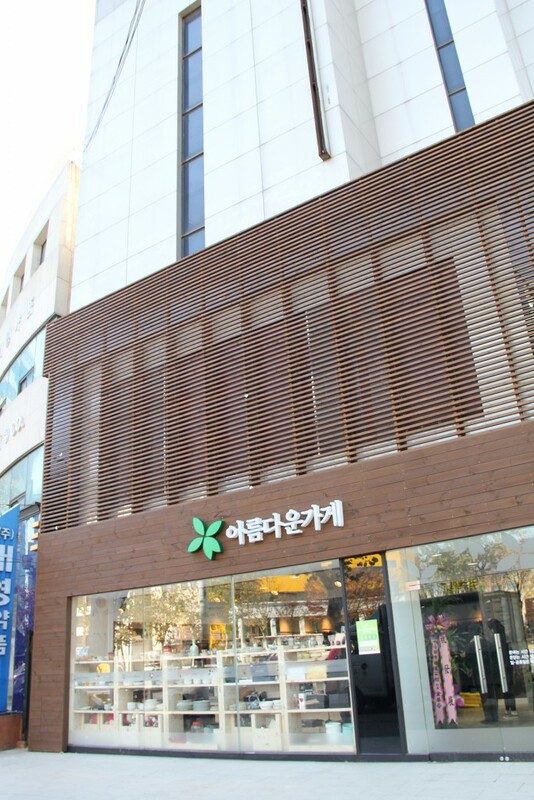 Beautiful Store is Korea’s leading chain of second-hand stores. Launched in 2002 with the mission of “creating a world of sharing and circulation where everyone participates,” Beautiful Store now has over 120 stores in 16 cities across the peninsula. 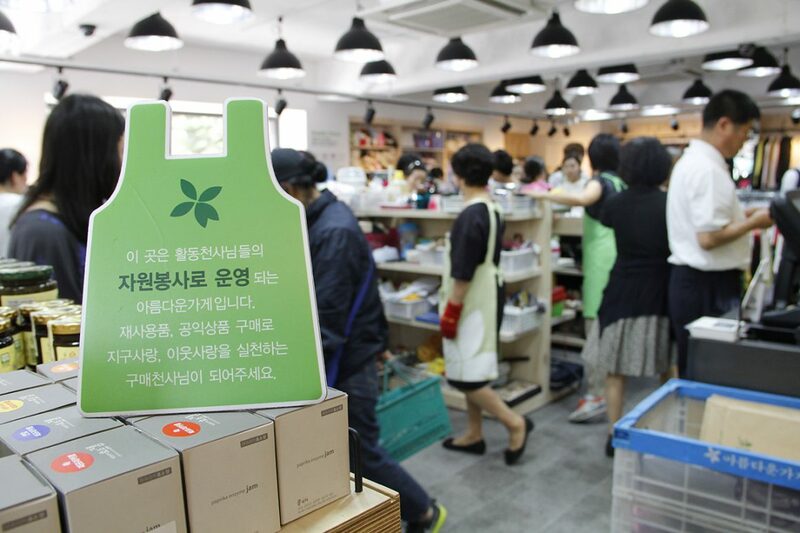 As well as reselling donated, used items, Beautiful Store also features products made by local artisans, and a range of eco-friendly, organic household and baby products. The company coordinates a range of charitable activities and volunteering schemes, also offering priority job placements to the homeless and vulnerable. The store organizes collections of second-hand furniture and household- item donations throughout the city, and accepts applications for store staff volunteers from anyone over the age of 18. For more information, visit the website or call 1577-1113. If you’ve a penchant for designer names but don’t want to fork out a fortune, then you must head over to Smith Market. Located next to the Express Bus Terminal, and with all goods also on the website, Smith Market allows you to, quite literally, take your pick from the little-worn designer purchases of the Gangnam elite. Newly available items are updated on the website daily, with pieces from Alexander McQueen, Valentino and Vivienne Westwood selling for up to 90 percent off their original price. Smith Market also buys designer clothes, shoes, and bags in good condition. The website is only in Korean, but non Korean speakers may find it worth enlisting the help of a Korean-speaking friend. If you’re lucky enough to have feet which fit into Korean sizes, you could bag yourself a pair of Jimmy Choos for as little as KRW 240,000. Looking for some vintage jeans, a jazzy tie or slouchy t-shirt to cut the sleeves off for summer? Vin Prime will almost certainly have what you’re looking for. 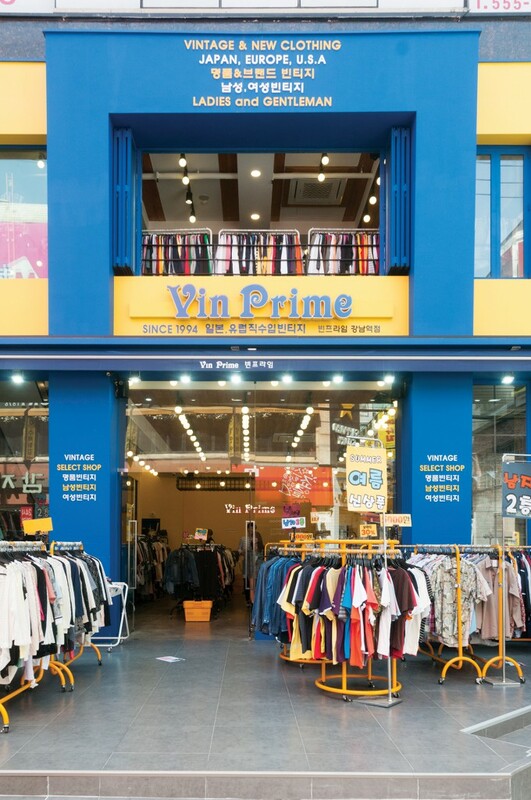 Although slightly more expensive than clothes you’d find in thrift stores back home, Vin Prime offers a very affordable – and fun! –assortment of clothes, shoes, bags and accessories for those looking to get their vintage on. Shirts are sold from KRW 3,000, with sweaters averaging at the KRW 10,000 mark, and jeans from as little as KRW 15,000. Vin Prime stores update their stock every day, meaning early morning visits (opening hours 10 AM-10 PM) are the best time to scout a good-quality bargain. The website is in Korean but offers easy to follow directions to their eight locations across Seoul. Offering just about every miscellaneous knick-knack you can imagine, the 500 vendors that make up Hwanghak-dong market next to Sindang Station might seem at first like an impenetrable maze of junk. Dig a little deeper amongst the overwhelming array of stands, however, and you’ll find just about any item of clothing, accessory, or household or electrical item you might be searching for. 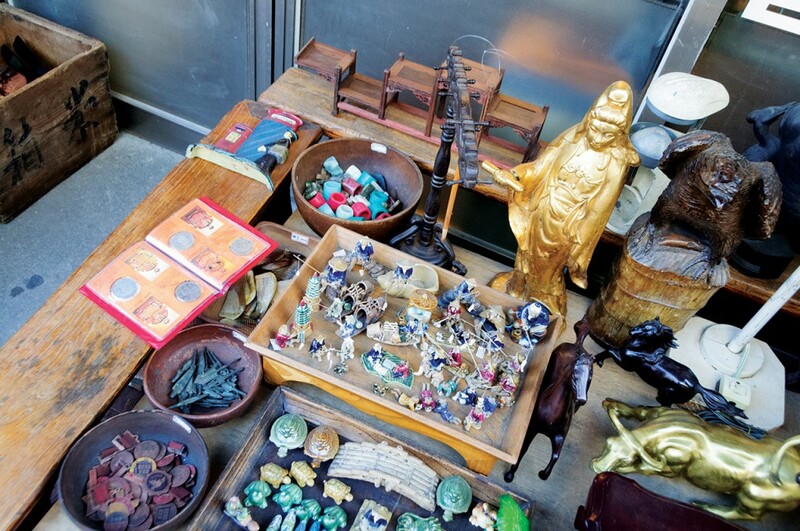 From bicycles to wigs, kitchenware, bags, jewelry and fishing gear – even if you don’t come away with a treasure, browsing the piles of wares at one of Seoul’s oldest trading centers for used goods is a great way to spend an afternoon. 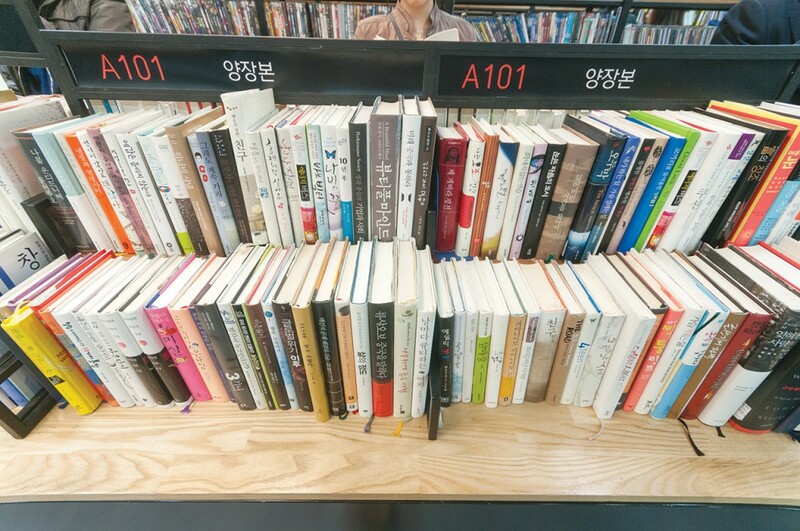 With seven branches throughout the city, including Sinchon, Jongno, Gangnam, Daehangno and Bundang, Aladin is a cave of wonders for the economical bookworm. You’ll find books in every genre: from cookbooks and self-help books to classic novels, poetry, study books and even CDs and DVDs. 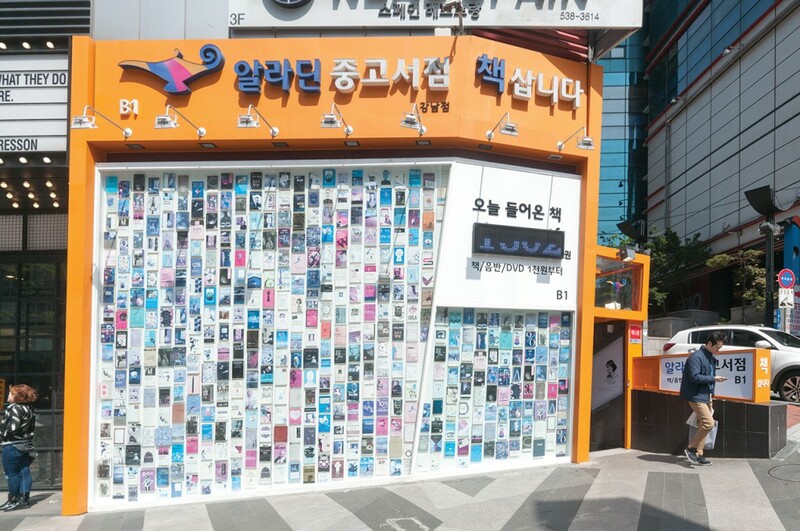 Although the majority of the selection is in Korean, each store also includes a sizable English anthology, offering an eclectic mix of fiction and non-fiction for a fraction of the price of regular bookstores. You’re perhaps unlikely to have much luck sourcing a specific English book here, but it’s an absolute treasure trove for those simply looking for their next few-dollar read. Students of Korean might also find Aladin worth a visit, as the English section almost always offers a large number of useful Korean language resources. Visitors may sell their old books and CDs to the store, although the amount you’ll get in exchange will depend on their condition and current demand.